Everybody loves spring. I mean, what’s not to like about balmy afternoons and BC in bloom? 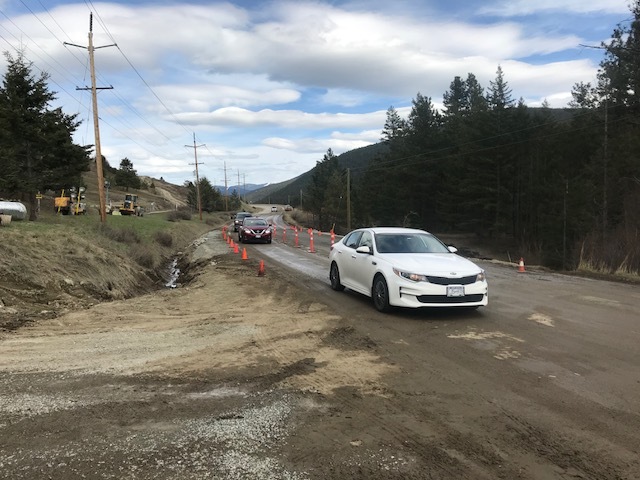 But as wonderful as spring can be, it also has a wild side (called freshet), as rapidly melting snowpack can oversaturate the ground supporting and surrounding roads, causing washouts. 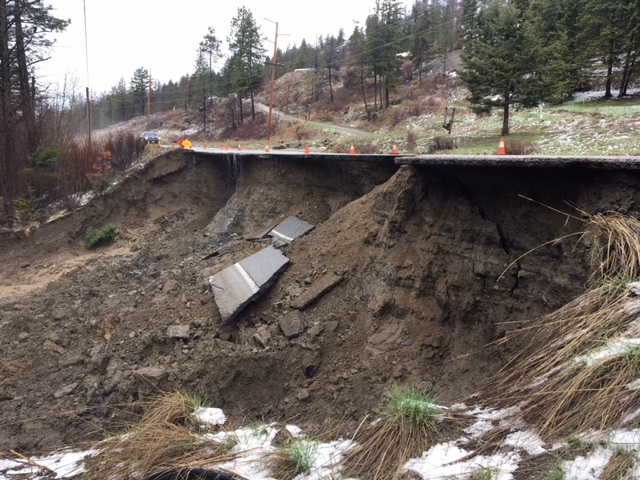 Washout damage often appears devastating – just look at the washout that closed Highway 33 south of Kelowna in April 2018 (above). It looked like it could take weeks to make it safe for travel. Can you believe Highway 33 reopened three days after this photo was taken? While not all washouts are the same, there are clear steps ministry staff take to put things back to normal. Let’s walk through them. 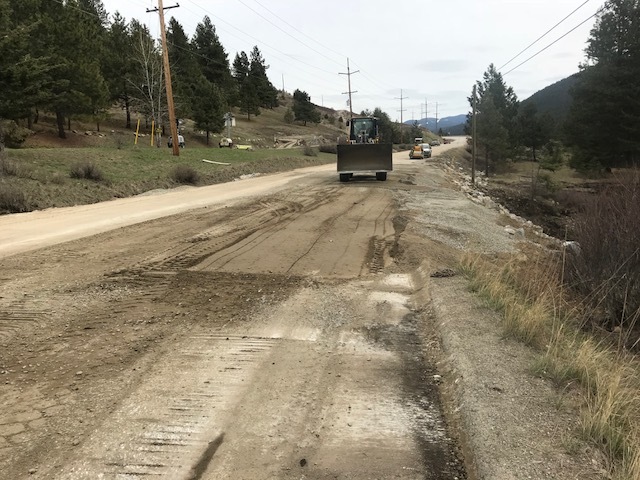 After a washout happens, ministry staff or our maintenance contractor will close the effected section of road to ensure no one enters the hazardous area, and implement traffic control and available detours. We communicate this information to the travelling public and commercial drivers via DriveBC, which is our online Traveller Information System, and through social media and news media outlets. Of course, we can’t immediately start rebuilding the road because the area is compromised. Before any action is taken, our geotechnical engineering team must ensure the site is safe for responders and workers, which means assessing the nature of the washout and ground conditions. For example, there could be continual water seepage and ongoing ground saturation to contend with. The geotechnical assessment can include a site “walkthrough” and, if parts of the area are unsafe or inaccessible, aerial surveillance via helicopter or drone [also known as an Unmanned Aerial Vehicle (UAV)]. Our geotechnical engineers also look for any structures or property above and below the site that may be impacted. The washout may have affected a waterway, such as a creek or stream, and possibly even a public water source. It’s important we determine this and notify local government and First Nations. Depending on the situation, our environmental management team may deem environmental mitigation necessary. For example, containment measures may be required if silty material is flowing into a waterway. Once the site is secure and the scope of the damage is determined, we make arrangements and/or enter into contracts to put the appropriate resources into place. This may involve coordination with utilities companies if underground or overhead utilities are within or nearby the site. Our geotechnical engineering team and local district staff will go over the site with the maintenance contractors to ensure the work is carried out safely. Rebuilding the road base can require culvert replacement and a significant amount of rock and granular fill. 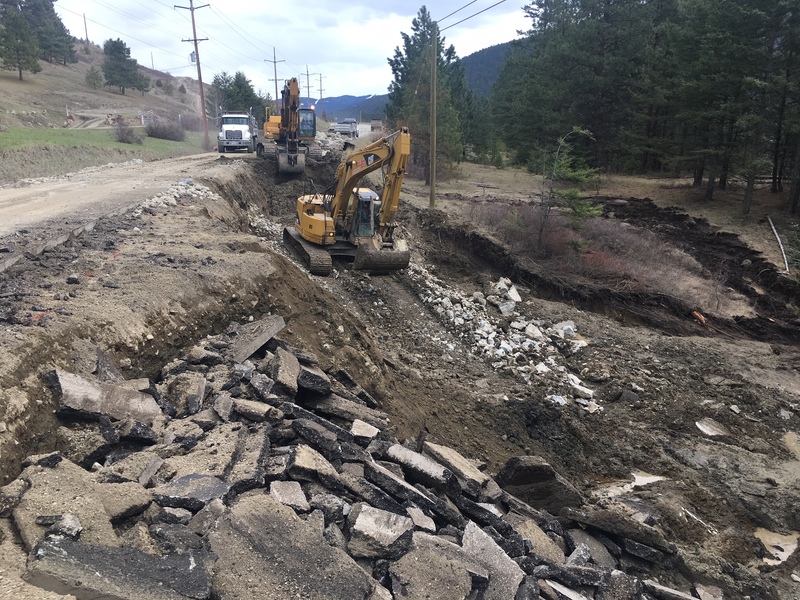 For the Highway 33 washout, for example, we used nearly 1,000 cubic metres of rock (just less than half an Olympic size swimming pool) and 175 cubic metres of pit run (i.e. gravel) to rebuild the road sub base. We also used 75 cubic metres of crush (fractured rock with sand) for the base course. There were three excavators, one loader, and between six and 12 trucks hauling material around the clock (12 during the day and six at night). Crews compact the ground, constructing a strong foundation. Then they add different gravel types in layers, before putting down pavement to create a uniform, smooth surface. Note: the highway is usually reopened to at least single lane alternating traffic as soon as it is safe to do so. Besides fresh line markings, the repaired section of road may also need replacement signage for speed limits, curves and other roadside warnings. Highway washouts are just one of the risks that come with spring freshet. Destabilized soil can result in mudslides and rockfalls, and general flooding is also more prevalent this time of year. Spring is a particularly good time to be aware of possible flooding in your area, and know how to react if flooding does occur along your route. If you come across any event impacting the highway and the safety of travellers, please report it to the local maintenance contractor. The quicker we know about it, the quicker we can ensure everyone’s safety and get people back up and moving. Most of these washouts could be prevented if the companies the Highways hire out to contract to maintain the Hwys were to do the jobs required to fulfill the road quality by checking and clearing and possibly upgrading or replacing the under road culverts. Never has this been more evident to everyone not just the inspectors even the general public. The highway companies that contract to maintain these culverts should have to pay to renew the highway if neglet has been proven to cause these washouts. Also the companies awarded these contracts should not be considered in the future if they cannot do this part of the job. People understand that on private property it is their problem, but it is up to the Ministry to enforce the contracts on the main roads and highways, who is not doing their job, the Ministry or the Contractors, seems to the General Public it is both getting paid too much for doing so as little as possible when there is no watchdog looking over them, so little pride, what a shame. Do they not realize even they for their laziness in their taxes too. Hello David and thank you for connecting with us here to share your concerns. We spoke with our maintenance program manager who confirmed that maintenance contractors are required to inspect, clean repair & replace all highway (MOTI) owned culverts. The inspection is annual and replacement is “as required” based on condition and must be done in a timely manner. The ministry also has staff who audit the contractors performance and diligence at inspecting / replacing culverts as needed. The current practice when a culvert is to be replaced is to request a hydrologic study of the area it drains and determine the max (200 year flood) cycle for that area. If required a larger culvert is installed. The exception is where there is not enough room under the road surface to fit a larger culvert in which case we may twin the existing if additional capacity is recommended. We have also replaced several large culverts with bridges if necessary. We hope that this helps answer your concern.